In his impromptu homily before confirming nine boys from the parish, the Pope repeated a point previously made to young people on his September trip to Sardinia, urging the confirmandi to not make the rite their "sacrament of farewell" from the life of the church. 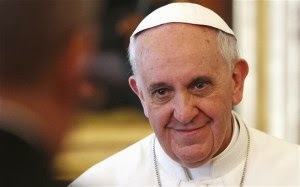 "Even after confirmation," Francis said, "all of life is an encounter with Jesus: in prayer, when we go to Mass, and when we do good, when we visit the sick, when we help a poor person, when we think of others, when we aren't selfish, when we're friendly... in these things we always meet Jesus. And this is the journey of life: walking onward to meet Jesus."